I constructed my first block for my lost in the crowd quilt today! Originally I was going to assemble the quilt in rows rather than blocks, but oh, Mylanta, that would be a pain. I figured out pressing directions to ensure that ALL the seams in the entire quilt should nest in the final quilt assembly, even if I construct it in a block based format. Nesting seams is very important to me because it produces a neat and tidy quilt top. Here's a rustic pressing diagram that shows my plan. (Arrows indicate pressing direction.) When I sew the squares into rows, the fabric is pressed toward the background fabric. When the rows are assembled into blocks, I will alternate pressing direction every other block. The A blocks will have the horizontal seams pressed up. The B blocks will have the horizontal seams pressed down. When the blocks are sewn into rows, every seam should nest. Hurray!!! I hope that makes sense to you and not just to me. Hahaha! One block done, 63 more to go! I counted today...I have 822/1200 4 patches made. Not too bad, considering that I started this project in February! I love seeing a plan come together. Because I know that someone will ask, the background fabric is Kona Lime. Are "B" blocks the same as "A" blocks, rotated 180 degrees? Having a plan can feel so empowering! I can only imagine how overwhelming it would have been to assembly the quilt in rows. Creating these blocks was a great idea. 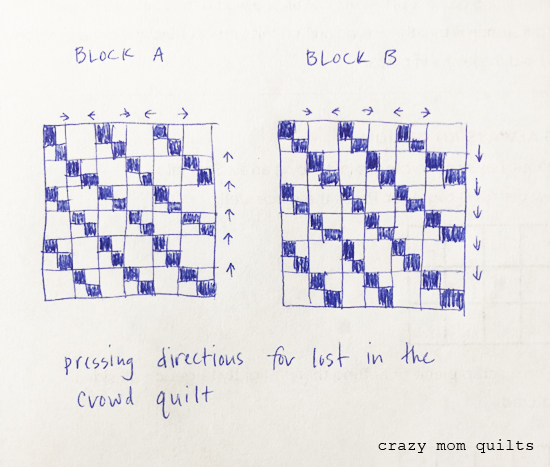 I think Kat is right--A and B blocks are the same, just turn the block upside down to get B instead of A.
I have a bunch of Tiny Nines waiting to be sewn into a quilt. I can only imagine your sense of accomplishment (as my quilt has gotten sidelined.) Love, love, LOVE using those small scraps!! Nice! and figuring out pressing hurts my brain! You’re just back from Glamp and sewing? I haven’t even unpacked my stuff.�� Guess I better get busy tomorrow. Very pretty! I love these blocks. I'm certain I've seen this before, but how big are your blocks? I can see how the A blocks and B blocks will nest when they are seen into rows but it doesn't seem as if the seams will nest when row 1 is seen to row 2. Am I missing something? I love it! Maybe this should be my leader ender for next year! This is beautiful! But with the nesting seams, why can’t you just press all seams to the background fabric regardless of whether they’re block A or block B? Won’t they all still nest nicely? The pressing directions make sense to me because that is the same way you helped me with my Strawberry quilt and it worked GREAT! Thanks for that. I love the Kona Lime and can't wait to see this progress! I love this! I've read all the comments, including the ones asking about nesting seams when the blocks are sewn into rows. 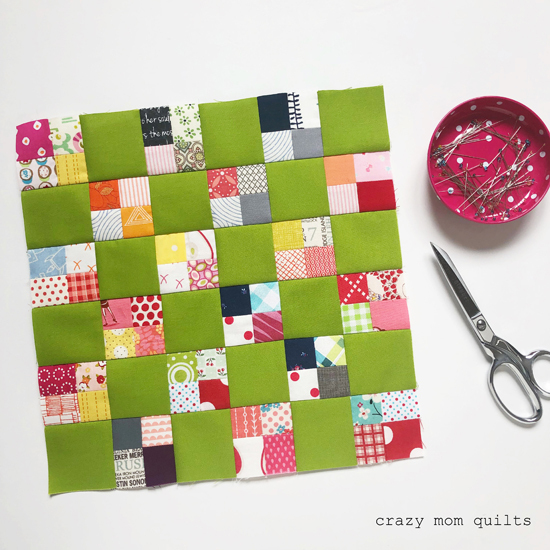 At first glance I think that if you always press away from the four patch units (towards the lime green background fabric) while making the block, the blocks will always nest because the units of the block alternate going horizontally and vertically. Does that make sense? I'm loving this and love that you've got it all planned out for us. I think you've just given me a new leader/ender project. Thanks! This is awesome and I want to make one too! I think your plan to assemble in blocks is the right one. Much easier to deal with that long, long rows! I love that you used green for the background. I think it's amazing that you are sewing this all together within about a year from when you saw Jean's quilt at St. Cloud Heritage Quilt Guild's meeting last fall. With all the quilts you make, putting this together in such a short time frame blows my mind. Congratulations. Oh, and I love the lime green, not a color I would have thought of to use. It is SO important to have seams nest. I am terrible at planning how to do that, I love this idea. I really want to make one of these, thanks for this tip! You are making great progress! I've started ironing my 4-patches open before sewing the remaining 600 2-patches together. 412 ironed vs 540 un-ironed. My huge, once-overflowing scrap box is now down 6" from the top! I've chosen a new 8-yd bolt of Kona Bone as my background fabric. Fun fact - I prewound 8 bobbins before starting, and at this point I only have 1 left. And I'll use the same 3,000yd cone of top thread exclusively throughout the project, just to see how much thread it actually takes! Thank you for sharing your project and your tips! Love this too. I'm just starting to assemble my quilt from your book No Scrap Left Behind - All Sizes. Finally have all my HSTs ready. Now I'm going to be itching to do this gorgeous one. It's a 9 patch with squares looking like they are 4-1/2 to 5" in size. She has taken her scraps & cut them down to 2-1/2" and then mixing them up & making a 4 square that goes in the middle of the 9 patch. Is that right? I have lots of scraps & this would be a good way for me to get rid of them. the only new I'd have to get would be the solid. Oh, what a bold, vibrant quilt this will be! I don't know why, but when you started making these little 4 patches, I just assumed you'd use a light neutral background (probably because your inspiration quilt did it that way). But this? Wow, just wow. Lianne - I think her 4 patches were cut at 1.5" each so finishing at 1". So each 4 patch is 2" sq. I am chuckling to discover that nesting seams are so important to you (and not just me ;o). It totally makes a difference! Cheering you on with the next 63 blocks!